The incidental writings of Soren Kierkegaard, published in the twenty-volume Danish edition of the Papirer, provide direct access to the thought of the many-faceted nineteenth-century philosopher who exerted so profound an influence on Protestant theology and modern existentialism. 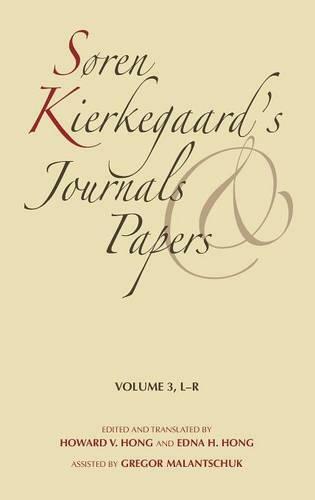 This important material, which Danish scholars regard as the "key to the scriptures" of Kierkegaard's other work, spans his entire productive life, the last entry of the Papirer being dated only a few days before his death. These writings have been previously inaccessible in English except for a few fragmentary selections; the most significant writings are now being made available in this definitive seven-volume edition under the editorship of two expert scholars and translators. The editors group the selections in Volumes I through IV by theme, with all entries on a given subject under the same heading. Within subject headings, entries are arranged chronologically, making it feasible to trace the evolution of Kierkegaard's thought on a specific topic. Volumes V and VI are devoted to autobiographical material. Volume VII contains an extensive index with topical crossreferences.